Kicking it back old school and retro, complete with scarves, tear drop shades, and paisley shirts, is London's Dirty Thrills. 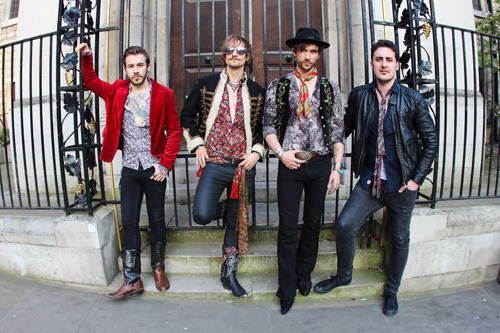 Formed after a drunken jam night, Dirty Thrills features vocalist Louis James, the son of singer songwriter Nicky James, notable for his solo work and ties to Moody Blues members Graeme Edge and Ray Thomas solo work. 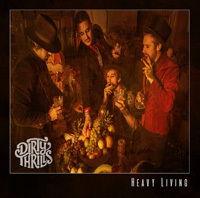 Heavy Living is Dirty Thrills' debut album for Italy's Frontiers Music. 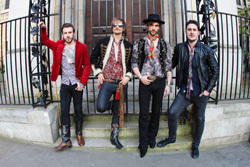 For their sound, Dirty Thrills trips back to Seventies to deliver gut level bluesy heavy rock. They begin with big, often fuzzed out, riffage, and then twist in some blues vibe in the guitar lines. Underneath those lines there's rhythm and groove that grinds and trembles like lovers under sweaty summer sheets. Above the fray James delivers vocals with passionate and bluesy power. Have no doubt, Louis James' voice is a force of nature. With the depth of his range, sometimes he reminds of a bluesy Bono. Wrap up all these things up and the songs rock with a steady and deliberate groove, and bristle with sharp guitar work. With songs like Rabbit Hole and Drunk Words, Dirty Thrills churns out their tunes with a low and slow persistence, like making smoky barbeque ribs in a wood-fired smoker. Alternatively, I'll Be With You or Hanging Around can offer some greater intensity, especially in the large riffage and James' reaching vocals. Then some swift pacing and rock groove come with the appropriately titled Get Loose. Within Go Slow, James lays down some sweet harmonica over the bass and drums in the latter third of the song. Finally, you'll find some true soulful blues in the quiet and smoldering ballad, Lonely Soul. The bottom line is simple. With creativity, enthusiasm, and respectful passion for the genre, Dirty Thrills reinterprets classic heavy blues rock for the modern era. Recommended. With creativity, enthusiasm, and respectful passion for the genre, Dirty Thrills reinterprets classic heavy blues rock for the modern era. Recommended.